We’d love your help. Let us know what’s wrong with this preview of Welcome to My House by Gaia Stella. To ask other readers questions about Welcome to My House, please sign up. Olga, a friendly black cat, leads readers through her home. She shows all of the objects in the house in a variety of categories. There is everything for sitting that includes a stool, chairs, and even a stack of books. Everything that brightens has candles, lamps, and a window. The lists continue with images of each item and a name. Everything that passes the time includes games but also brother and sister. While this is a look at the objects in a home, it also speaks to the various roles that Olga, a friendly black cat, leads readers through her home. She shows all of the objects in the house in a variety of categories. There is everything for sitting that includes a stool, chairs, and even a stack of books. Everything that brightens has candles, lamps, and a window. The lists continue with images of each item and a name. Everything that passes the time includes games but also brother and sister. While this is a look at the objects in a home, it also speaks to the various roles that the people in a home can have. This French import is a lovely book, however I am not sure who it is really for. Olga the cat tours the reader around her apartment, pointing out different items in it. She opens the book and closes the book with chatty conversation. The rest of the book is a listing of items in the home. Grouped together on two page spreads as "Everything for sitting", "Everything that brightens", "Everything in the Kitchen", etc., 25 or so appropriate objects are pictured and labeled. For the most part, items This French import is a lovely book, however I am not sure who it is really for. Olga the cat tours the reader around her apartment, pointing out different items in it. She opens the book and closes the book with chatty conversation. The rest of the book is a listing of items in the home. Grouped together on two page spreads as "Everything for sitting", "Everything that brightens", "Everything in the Kitchen", etc., 25 or so appropriate objects are pictured and labeled. For the most part, items would be found in a typical home. However, there are some very unusual items for really young children to know/learn, for example "chaise lounge", "wood-burning stove", "wardrobe". Additionally, some items would be difficult to guess what it is unless it was labeled, for example "wicker chair", "porthole window", "plate", "microwave". An oddity is the index in the back that refers to the page each item is listed. Thanks to the @kidlitexchange network for the review copy of this book - all opinions are my own. Thanks for reading! 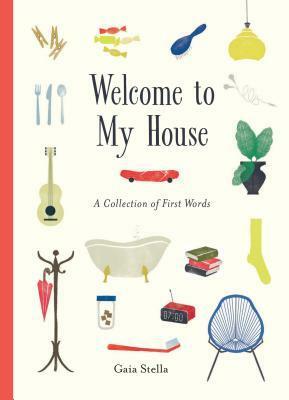 WELCOME TO MY HOUSE is a sweet word book from illustrator @gaiastella. In the book, a little cat named Olga takes the reader on a tour through her apartment. On each page, she shares items in creative categories, such as "everything that brightens," "everything that passes the time," and "everything for tinkering." I can still remember looking through word books like this when I w Thanks to the @kidlitexchange network for the review copy of this book - all opinions are my own. Thanks for reading! 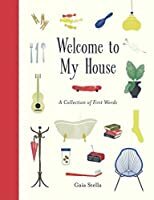 Welcome to My House by Gaia Stella is a picture book of first words sent to me through @kidlitexchange to read and give an honest review. 🌟🌟🌟🌟🌟 In this cleverly illustrated book we were able to point out things in every room of the house to compare with our own home. There is also a clever little kitten that keeps popping in on every page keeping children searching for what room will be next. Review also posted on Instagram @jasonnstacie, Library Thing, and my blog at readsbystacie.com. I love the style of the various objects in this book-stylized and painterly. This would be best for one-on-one sharing with an English-speaking adult. I was hoping it could serve as a picture dictionary for non-native speakers, but because of the stylized illustrations and set up of the categories, it would not work for that purpose. Take your time reading this book. It's about the different items that can be found in a house. All the single illustrations are labeled and it takes a while to get through each page. beautiful artwork and layout design. Kids will love this sort of interactive seek-and-find as they spot different things in their own house. A fun way to develop the skills to decode and categorize. Word book with interesting categories. Charming and sometimes surprising categories and items. You can tell its french. I want to frame the pages on my wall they’re so cute! My favorite collections are everything in the kitchen and everything that gets lost.